The House of Israel is a “pseudoreligious cult that has little to do with religions. Hugh Hoyte and Rabbi Washington, 70s. Sometime in the mid-60s, amidst all the Civil Rights protest in the United States, one David Hill formed the House of Israel in Cleveland, Ohio, where, by then, he already had a criminal record that started decades before. Well known in the Black community there as “Bishop,” Hill teamed up with the Reverend Earnest Hilliard (known locally as the radio personality, “Prophet” Frank Thomas), and became very active in the local business sector of Cleveland. Shocked that whites owned most of these businesses including McDonalds, they started the Black Unity Campaign against McDonalds, and convinced the locals to boycott the fast-food giant, as well as supply the revenue to start the first black-owned fast food enterprise. Locals signed off cheques for $5,000 and singed franchise application forms. In 1969, Hilliard was found in his garage, shot in his head. Although Hill was questioned as a suspect, nothing came out of the investigation. Hill became suspect to some of the locals who eventually discovered that the duo’s plan was a scam. Hill was found guilty for blackmail and sentenced to serve a 4-25 years term. Within weeks after the conviction, Rabbi was granted appeal bond. In another trial, a Chicago grand jury found him guilty of grand theft felony charges. Bail, which was originally set at $150,000, was eventually reduced substantially. A bondsman affordably posted it, and thus, Rabbi was released…only to jump bail thereafter. By late 1971, he failed to appear in court…suddenly convincing people that Rabbi had left the country, via the assistance of government officials (which he had bragged about). He would later be convicted in absentia on two counts of larceny. After arriving in Guyana sometime in 1972, he announced himself as Rabbi Edward Washington, in an attempt to cover his true identity, and began the House of Israel (again), which would become a thug ally of the ruling PNC government, it’s headquartered being the Central Synagogue. The US Government’s refusal to extradite Rabbi is still murky territory, and many still believe that justifies the claim that Rabbi was part of the CIA/ US Government aid to keep Burnham in power. The House of Israel: This name, as I understand it, is the name that the Falasha people, an Ethiopian Jewish tribe which called themselves the House of Israel and claimed lineage to Menilek I, traditionally the son of the Queen of Sheba (Makeda) and King Solomon. Despite its name, the House of Israel had no ties with traditional Jewish theology, biblical lineage, or for that matter, any connection with the Ethiopians. It was simply and essentially a Black supremacist movement. Unlike the People’s Temple (Jim Jones) that started in the US but had primarily US-born Black members, members of the House of Israel were primarily Black Guyanese. Through its daily program that aired on the state-owned radio free of government criticism, it preached that Africans were the original Hebrews and needed to prepare for a racial war. This racial war was in Rabbi’s words, the “battle of Armageddon” between Blacks and Indians. Rabbi even boated that his organization was a “military operation” which “need to be prepared” for this eventful day. In February 1980, the WPA, using government documents, made public headlines showing that arms flowed from the Guyana Defense Force to Rabbi’s organization. Scab Labor and Terrorism: The hymen-like association between the House of Israel and the Guyana Government (and PNC party), was symbolized by the colors that the members wore, which were, incidentally, the same colors of the PNC party and the Guyana Government (Guyana’s national colors). But a greater connection can be made through the terrorist nature of House members in favor of the Burnham government, beating up on opposition political activists and providing scab labor. While Father Darke’s murder is the most famous of the crimes committed by House members, there were other cases. Mike James (also from Catholic Standard) and Gordon Yearwood, who was a fierce, well-known critic of Burnham were also beaten and stabbed respectively that fateful day. The police, instead of seeking to apprehend those responsible, set up guard at the House of Israel premise to prevent angry members of the public from retaliating. In a climate that saw the rise and demise of Jim Jones, the arrival of the Black Power advocate from the US, Stokely Carmichael, who preached that Blacks should do whatever was necessary to have absolute power, the emergence of Burnham’s socialism, the economic restrictions and reduced standard of living due to IMF loans, and immense anti-government sentiments, the arrival of Dr. Walter Rodney not only breathed new and energetic fuel into the Opposition’s turbine, it brought the single most dangerous threat to Burnham. The WPA became the chief target for the House of Israel. 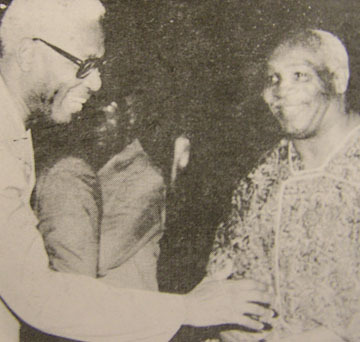 Below is Eusi Kwayana’s account of one such WPA rally that was broken up by Rabbi’s men at Delph Street and Campbell Avenue in Georgetown on August 22, 1979. One month earlier, in July of 1979, the building, which housed the office of the General Secretary of the PNC and the Ministry of National Development, was burned down. Despite eyewitnesses’ claims of seeing men in army uniforms, leading WPA leaders/political activists including Drs. Rodney, Roopnarine, and Omawale were arrested. While thousands protested at their trial outside the court house, news photographer for the Catholic Standard, Father Bernard Darke was stabbed to death in the presence of onlookers (police included). Those who did the stabbing were members of the House of Israel. Despite all of this, chief PNC member Kit Nacimento, one week after the crime, referred to the House of Israel as a “religious group that lives in a cloistered, communal atmosphere. The members have declared their support for the government and they haven’t committed any crimes. There is no reason why we should be concerned” (Toronto Star, July 22, 1979). The ordinary layman Guyanese may never know the true nature of the House of Israel. Was it a criminal organization? Was it only a Black power movement that opened its doors to no one who was not Black? Were the people who disrupted and prevented delegates from attending the annual general meeting of the Guyana Council of Churches in Georgetown in 1985 from House of Israel? Was David Hill, a.k.a. Rabbi Washington an instrument of the CIA/ US Government in their assistance to Forbes Burnham, in what was an exchange of prison time in the US for terrorism in Guyana? In a country like ours where history was rarely recorded, and when it was, it was done in accordance with the whims of the ruling government, it is difficult to discredit people or organization correctly for regional and national failures. People can only assume what they have heard, and may only be convinced themselves of what they may have seen. Thus, with rare police, court, or national archival records of many of the notorious activities of the past, one is forced to fit rumors and assumptions into perspective of their national history. While the criminal role of the House of Israel was rarely a question, the extent of this role is what remains, still, a subject of debate. In the end, one can only feel somewhat justified that where the US Government failed to keep it’s convict in prison, Burnham’s successor, Hugh Hoyte, made sure that Rabbi Washington and key associates were charged and imprisoned on a long-standing manslaughter charge.